Note: Ben is only home for a few weeks before he heads of to Aconcagua for the Polish Glacier (Jan 10) and False Polish (Feb 2). We still have a few spots left on each trip as well as the Feb 2 Polish Glacier with Stu Remensnyder. See the FTA site for all the details! Well what an amazing season! I have finally made it back home to Australia. Its been an epic Autumn season in the Himalaya, and we've had so much fun with such a great crew. Ama Dablam was a great success and we topped out on the 24th of Nov in very clear weather. 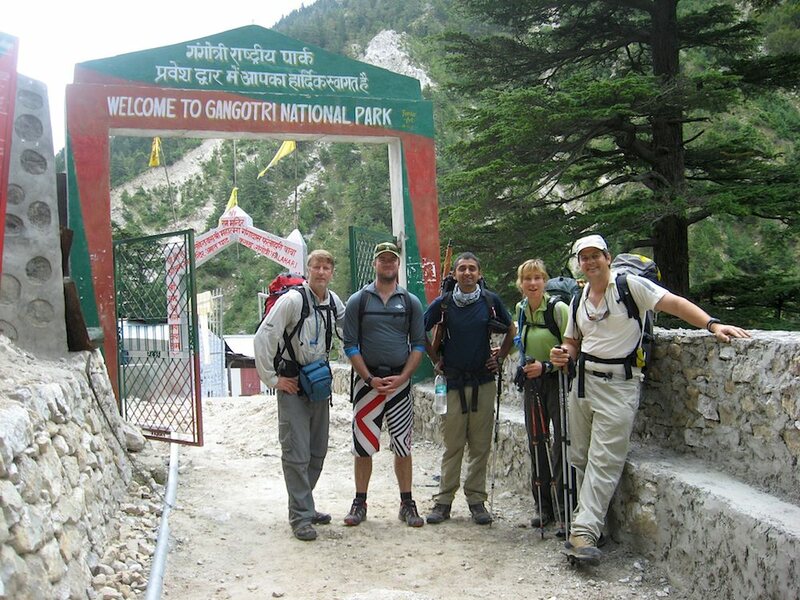 It was great to be back on the mountain that was my introduction to the high Himalaya back in 2007. 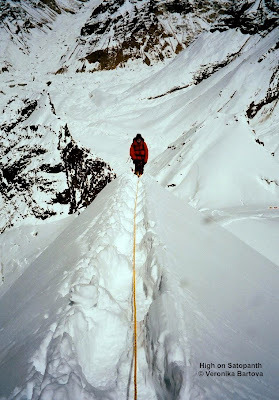 The upper part of the route seems to have changed dramatically since then, with more hard ice and exposed rock. Having said that, we managed to summit from Camp 2, which involved some incredible night climbing of the Grey Tower and a stellar dawn on the exposed Mushroom Ridge! For lovers of exposure, this is a must do climb. 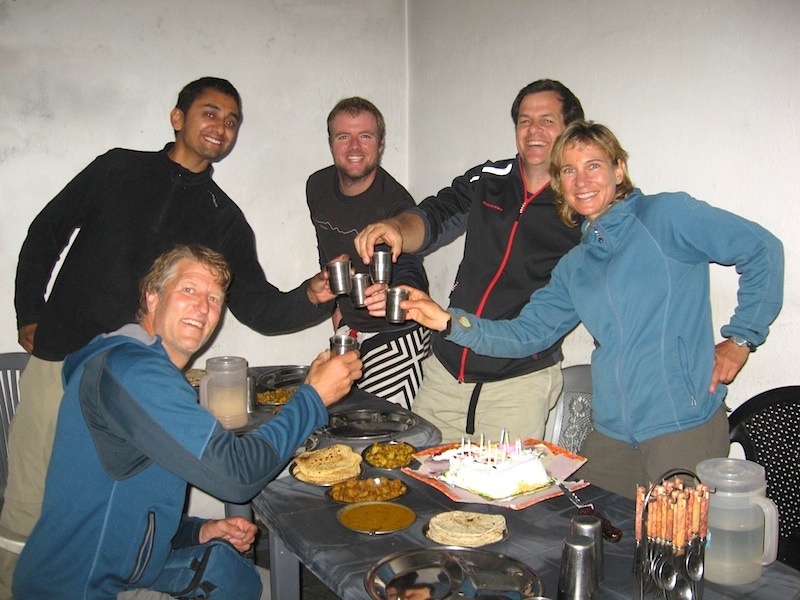 Our Khumbu Peaks and Passes expedition in October was a blast. 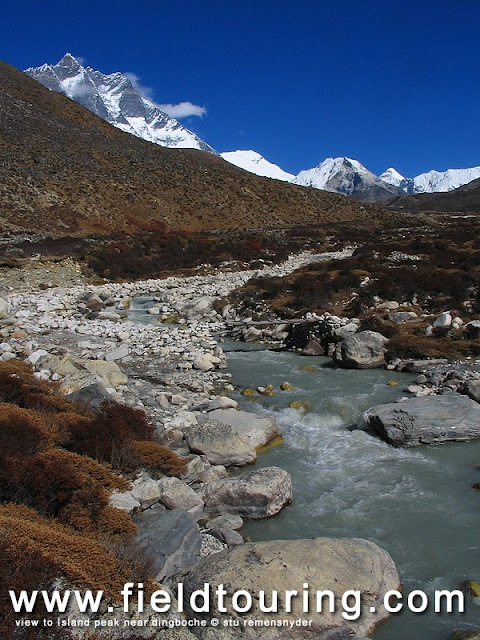 For those that wish to get to know the Khumbu & Gokyo region and do a bit of climbing along the way, this is a full itinerary jam-packed with four peaks and three high pass crossings. A superb introduction to Himalayan climbing. incredible climb. Incredible India they say, and it is true. A big thanks goes out to our local staff, Siddhi, Pemba, Uttara, Ratna, Arun and of course Nima T. Sherpa. Thank you so much. I'd also like to thank our Ama Dablam guide staff Brad Jackson (assistant guide) and Meagan McGrath (guide-in-training) for their great contributions. Finally, I'd like to thank all of our members that joined our expeditions, Gavin, Scott & Nicole, Veronika, Richard, Seng, Mattias, Colin and Bryson. Thanks for a wonderful Autumn and for all the great memories. All the best for the future and I hope to see you out in the hills one day soon. As for me, straight back into training! 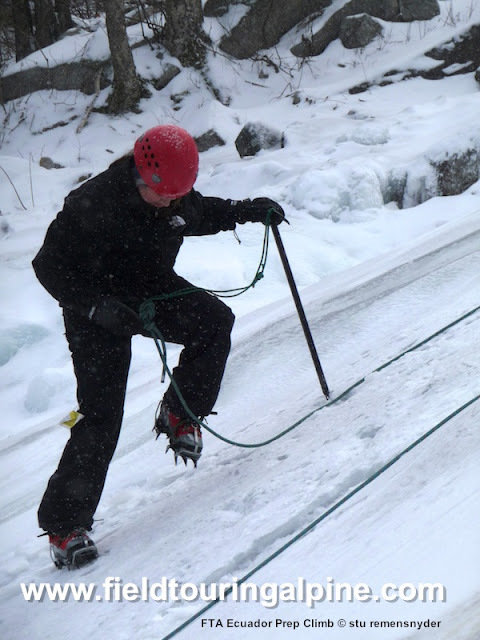 We've got our Jan 10 Polish Glacier and Feb 2 False Polish and Polish Glacier climbs coming up shortly, and with spaces filling quickly, make sure you jump on as soon as possible! These trips are about the most fun you can have in the mountains, a great introductory to high altitude with minimal objective danger and the rich cultural experience that Mendoza, Argentina has to offer (and the best Malbec & steak in the world). 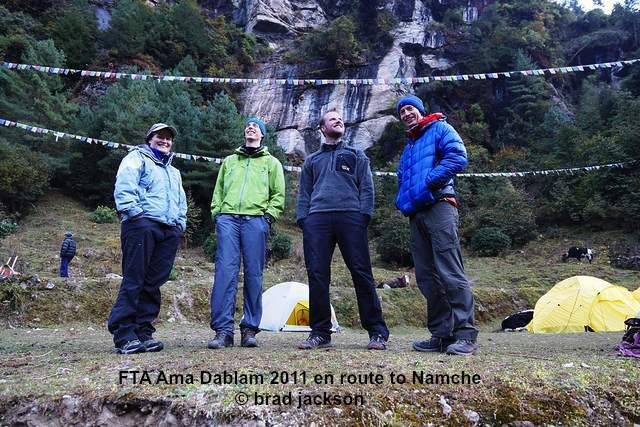 FTA Ama Dablam 2011 - Summits!! 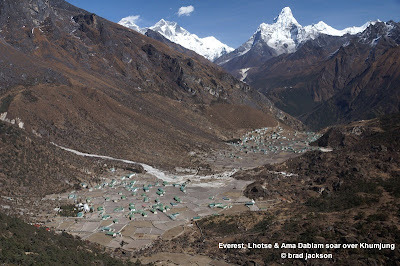 Ben called in a few minutes ago from camp 2 with Ama Dablam summit news - here goes! The entire team left at about 2:30am on a clear and calm morning and then made their way up the Grey tower fully in the dark. 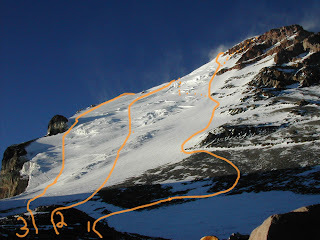 Ben said that it was a wonderful climb and that he enjoyed it even more than when he has climbed it during the daytime. There is something about climbing in the dark that is hard to describe but the small pool of light that illuminates your small section of the route give you complete focus on the next step but little more. The sense of scale and danger that can give you vertigo in the daylight are absence and the experience is much more intimate. 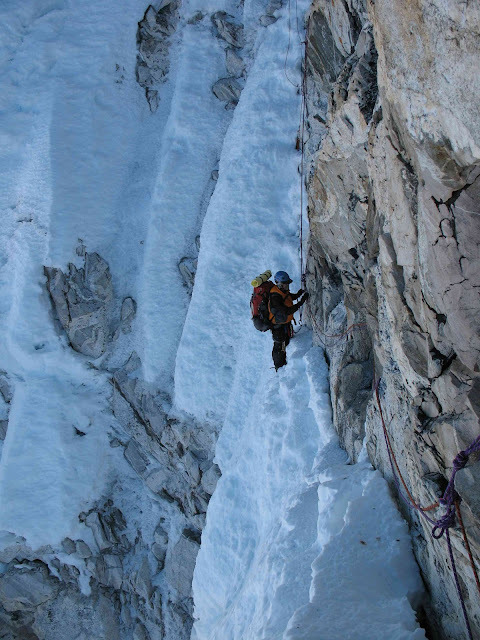 Mostly just the sound of your crampons scraping on the rock or crunching in the ice and the distant din of other climbers the only hint that anyone else in the world exists. As the sun broke and they crested onto the Mushroom Ridge the wind picked up and it was very cold for a few hours but they were already well warmed up from the earlier effort. Ben estimates that they had winds of perhaps 15-20 km/h which was about as good as we had hoped for but this wind still sapped them a bit and it stayed with them for much of the rest of the morning. 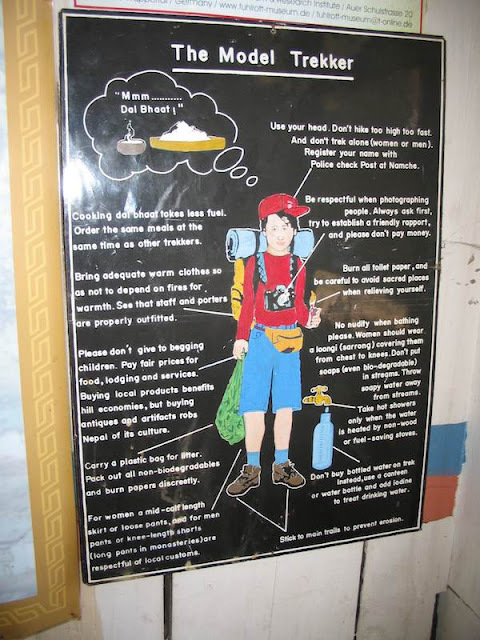 Ben said that they all climbed with down jackets on when it can be quite usual to only have on a down jacket at rest points. 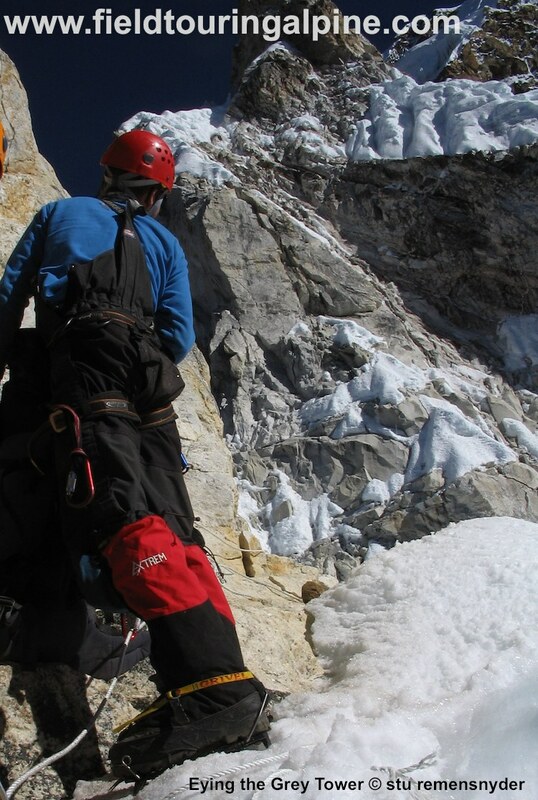 They encountered very hard blue ice along the side of the "dablam" above the old camp 3 and Ben said it was very difficult climbing and they all enjoyed it thoroughly. As they neared the top the winds died down and Ben said that it was "stinking hot" climbing the last 20 mins or so and that he was really surprised how quickly the temperature moderated. 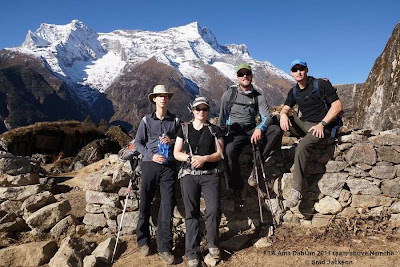 As such they enjoyed a calm and beautiful summit celebration with view to Cho Oyu, Everest, Makalu and of course looking down on Island Peak where they had been just a week ago. 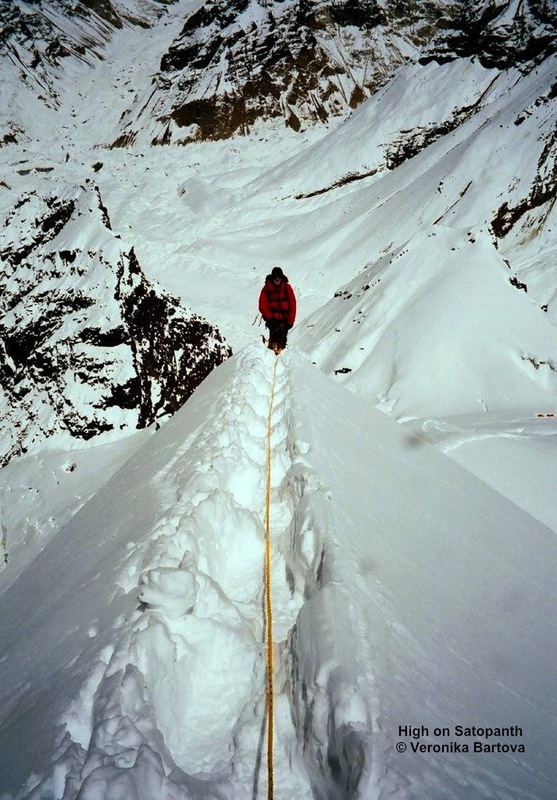 Brad made a prudent decision to abort the push about an hour or so from the top and begin to work back towards C2 and to be ready to support and challenges the summit group might have on the way down. Always good to have level headed climbers who climb within themselves and Brad is a great example. 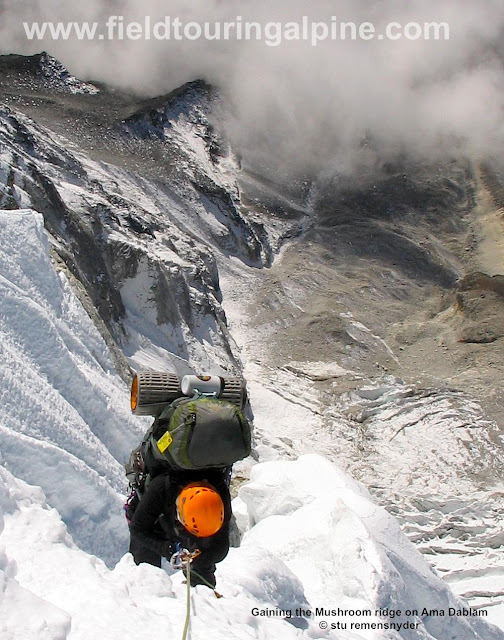 Taking several efforts to summit Everest and with climbs on Ama Dablam, Denali and more in his background Brad follows in the Ed Viesturs model of knowing the hill will be there next time and following gut instincts... good stuff Brad! 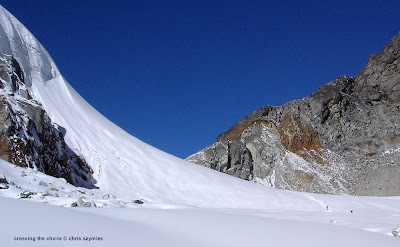 Ben noted that the summit area had changed considerably in the last few years and that it is no longer a long flattish top but rather marked by crevasses and a series of minor peaks. 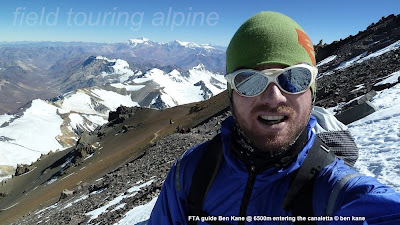 It will be interesting to compare images from Ben's last summit and this years. We'll have a great image gallery for the main site put together when the team is back in Kathmandu and post a bunch here. The team will clear the hill and had back to BC tomorrow for a well earned summit supper! 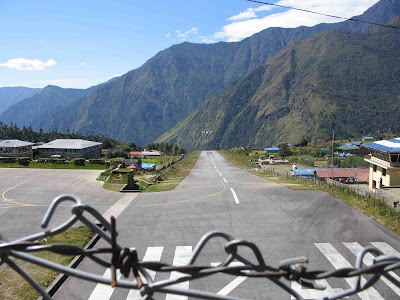 They have already moved up the flights from Lukla and now hope to be back in Kathmandu on the 29th if all goes well. Ben will then get a well deserved break until the heads off to Argentina in January to lead our Jan 10 Polish Glacier climb and our Feb 5 False Polish Glacier climbs. We have spaces still on both climbs as well as our Feb 5 Polish Glacier climb (with Stu) so let us know if you want to join Ben and FTA for a trip to the top of the Americas! We are already taking bookings for Ama Dablam in May 2012 as well as Oct and Nov 2012 and are looking for motivated climbers to join us! We'll have more updates as the team makes their way out to the hustle and bustle of Kathmandu so stay tuned! 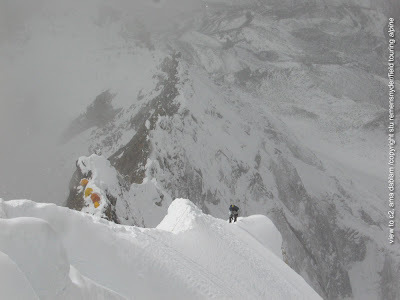 FTA Ama Dablam 2011 - in C1 on summit push! Ben called in a few minutes ago to let us know that everyone was feeling great in C1 and they are planning to move up to C2 tomorrow. They had a great weather all day long but for a few clouds in the afternoon. When Ben called they were brewing up tea and and enjoying a beautiful and clear sunset. If the winds remain calm they'll aim for the top on the 24th or 25th.The last few days have seen very calm winds but they are unfortunately looking to pick up a bit for the next 4-5 days so our team will have some wind for sure and we hope not too much. 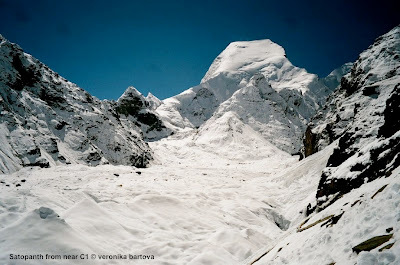 The predictions are for winds between 15 and 30kmph at the 7000m level and depending on how much shelter they get from the wind they may not even feel much of it till the summit plateau. I recall in 2005 having nearly no wind all the way to the top but just after cresting the ridge with winds were so strong you could not hear another person talk and spending more than 5 mins on the top made no sense. After dropping down just 50 meters it was once again quite calm and nice. We'll hope our team sees such a pattern enabling them to climb with little or no wind for most of the day. The teams coming down have mentioned that the mushroom ridge is quite soft and it has been difficult to manage with big packs so our team is looking to summit from C2 to avoid the need for heavy packs to C3. As such they will have to depart at 2am and manage the cold of the early morning before catching and warming rays if sun. Our team in 2010 did this as well so it is something Siddhi is ready for and has good experience doing! The team has spare days yet so they will be cautious about pushing through cold and wind and if this bid does not go they will rest up a few days and try again. Ben plans to call in from C2 with the latest on the plan for a summit bid and we'll have that tomorrow! FTA Autumn 2011 - Summit push is on! FTA Ama Dablam 2011 - Island Peak Summits! Ben just called in from Dingboche with the great news that all 6 members of the team summited Island Peak today and are all safely back down! 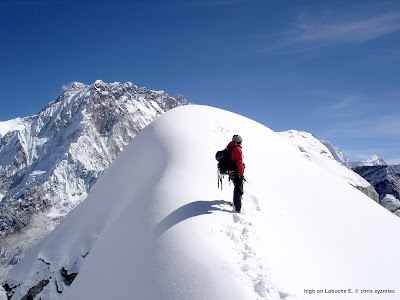 They left Island Peak BC on a crisp and clear morning at 2am and topped out at 9:30am with perfect views of Lhotse, Nuptse, Ama Dablam, Baruntse, Makalu and more. After many days with clouds and snow they were treated to a great day for a summit push. Ben said they climbed well as a team and were all really happy to make the first of hopefully two summits! 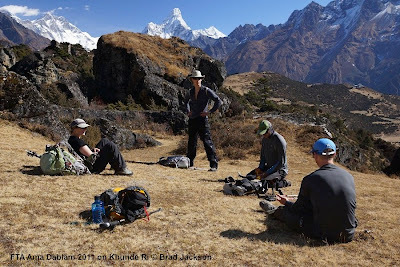 After enjoying a celebratory rest on the top they made their way back to base camp by noon and decided to make a good push towards Ama Dablam BC. The happy team had a well-earned lunch, packed up and tromped for another 5 hours and arrived at Dingboche at 7pm by headtorch! They all really wanted to get back down lower for a good sleep and to make the trek back into Ama Dablam BC tomorrow an easy one. Looking back to Island Peak from near Dingboche. Everest is lurking somewhere behind the massive Lhotse wall on the left! 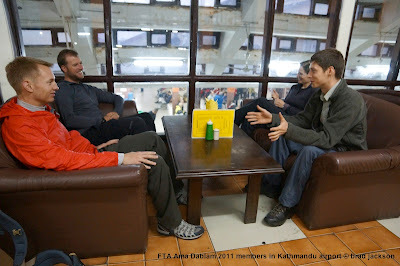 Ben called in a short while ago from Namche with the latest on the team and it sounds like everyone is doing very well! They had just come down from a good day on Khunde Ri and pizza in Khumjung and are headed off to the rhododendron forests of Tengboche and Deboche tomorrow. On Oct 6th, after a day of prep in Kathmandu, our team departed early in the morning for the airport without much optimism in catching a flight to Lukla. 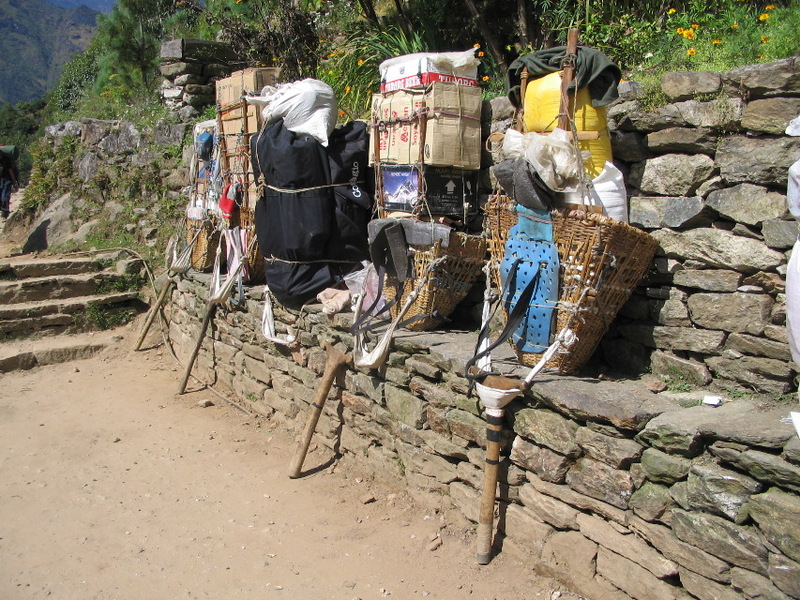 The delays due to weather had stranded a large number of trekkers in Lukla and created a huge backlog in Kathmandu - with estimates of some 1200 or more at each end of the short flight. When it became clear our team would be unable to board one of the regularly scheduled flights, our amazing ground agent Nima pulled a few strings and secured a helicopter. 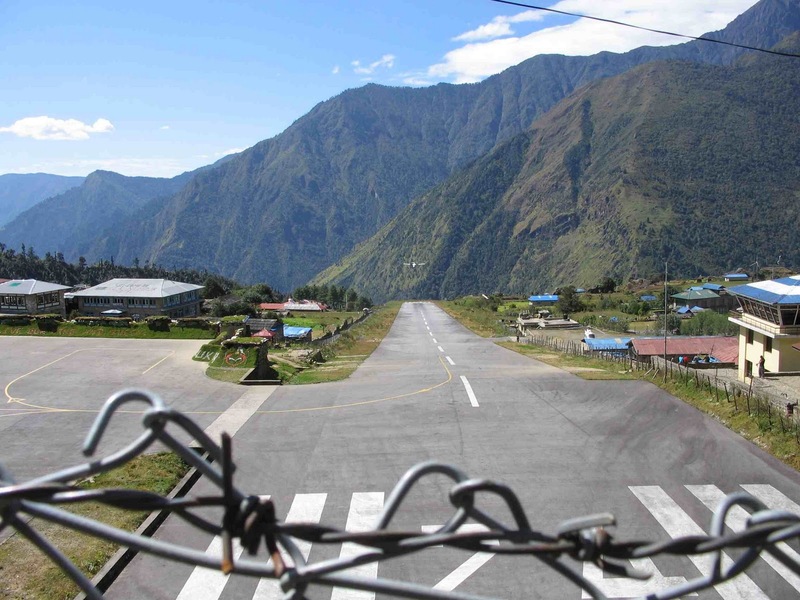 Faced with the depressing prospect of returning day after day to the airport, our teams was suddenly in the air and shortly after in Lukla! Due to the limited carrying capacity of the helicopter only half of the bags went up the team and the plan was for Nima to accompany the remaining cargo on a later flight. Nima left shortly after as planned but unfortunately his flight was turned about just before Lukla due to continued bad weather and he returned to Kathmandu. On the 7th Nima was able to make the full flight to Lukla and arranged the bags to be sent by yak and porter to catch up with our team in Namche. So all in all Nima spent nearly 2 full days just making sure our team and bags made it up to Lukla. 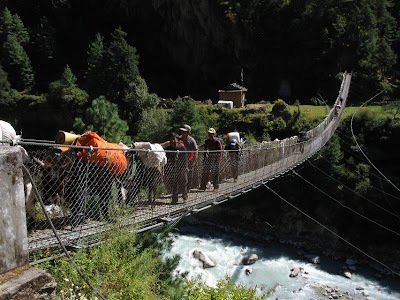 Attending to the myriad of small details to ensure a smooth trip is sufficient work in and of itself and it is clear year ofter year that not many teams have such a dedicated and connected person to work with in Nepal. We at FTA are grateful to Nima's personal attention and caring nature and know we have been fortunate to have made his acquaintance more than eight years ago. 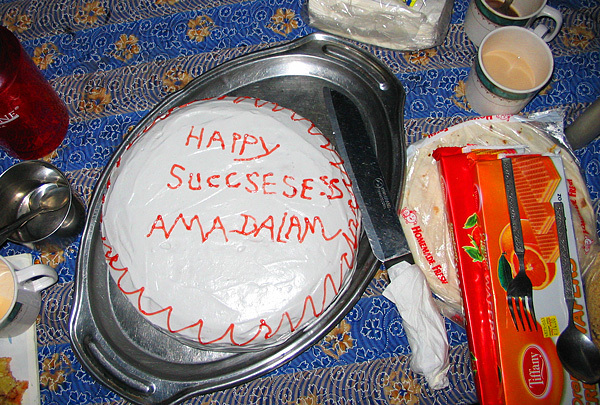 Thanks again Nima Dai! 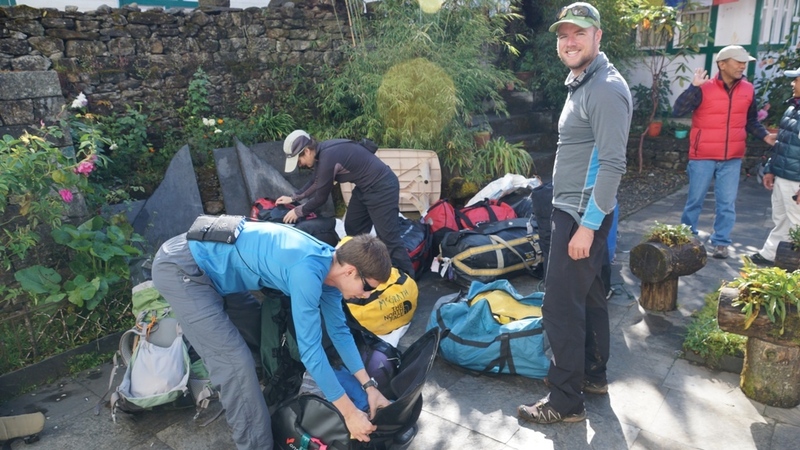 After arriving in Lukla and working there way down the valley the team spent the night near Phakding and began going over key topics for the trip which include everything from health and sanitation to altitude medicine and climbing techniques. Ben, Brad and Meagan will be covering a large list of topics and will share with the members everything they have learned from their collective climbs, expeditions and adventures. Given where these three have been this is a not inconsequential list. Between them the have been to the seven summits and both poles and the list of expeditions is rather daunting: Aconcagua (Polish, Falso and Normal), Ama Dablam, Broad Peak, Cho Oyu, Denali, Everest, Island Peak, Kilimanjaro, K2, Lobuche, Lhotse, North Pole, Tharpu Chuli, Satopanth, South Pole, Vinson, and on and on! Since arriving in Namche on the 8th the members have been working on good acclimatization with an easy day on the 9th (including a dry run on fixed rope technique) and a more full day on the 10th which included summiting Khunde Ri (4500m) and the all important traditional pizza and in the Everest Bakery in Khumjung. Brad Jackson is the designated photographer and he has sent the following images to give a sense of the journey so far...enjoy! View from Khunde Ri during our crucial second acclimatization day in Namche. We'll have more from the team in the days ahead! Passes expedition. We are already looking forward to coming back again in 2012 so book your spots soon! Despite Seng having to leave the trip early and an impassable Cho La due to snow conditions, the trip was quite successful. 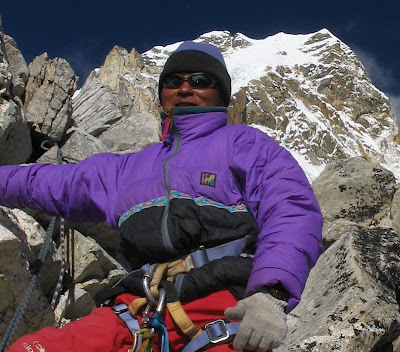 Seng set a new personal height record on Chukung Ri at 5400m and the rest all managed to get a 6000m summit. It was a jam-packed itinerary with everyday bringing a new experience and wonderful vista. Our Nepali staff worked had to provide us with a great mobile 'base camp', the quality of the food outstanding and they were always there to give insight and perspective on the local culture. A big thank you goes out to Tsering Rai, our much loved Sherpa, along with our cook Pemba, both of who worked long hours whilst we took in the amazing landscapes! 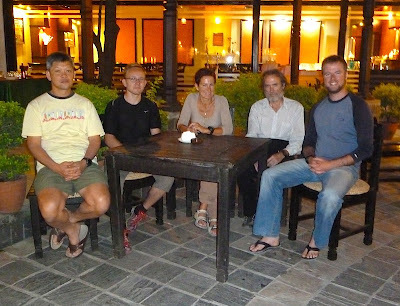 I'd like to wish Veronika, Mattias, Richard and Seng all the best for the future and thank them for being great members on such an amazing and fun expedition. Ama Dablam is underway in the next few days, keep checking in for updates! Spantik update - Safe in BC and headed out tomorrow! Ben called in from BC to let us know that Gavin pulled out a stash of champagne and they had a great toast to the success of the trip last night! They will enjoy a final day today at BC getting packed up and ready to go when porters will arrive on the 25th. 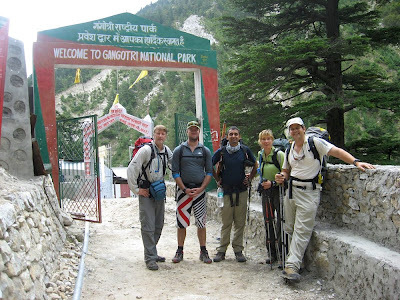 They will be out to Gangotri on the 26th and back in Delhi on the 29th if all goes well. We will look forward to seeing all the photos from the climb and post a bunch here in a weeks time! Already we are getting prepared in Nepal as we head to the Khumbu with Island Peak, Lobuche, Ama Dablam and more in the months ahead! 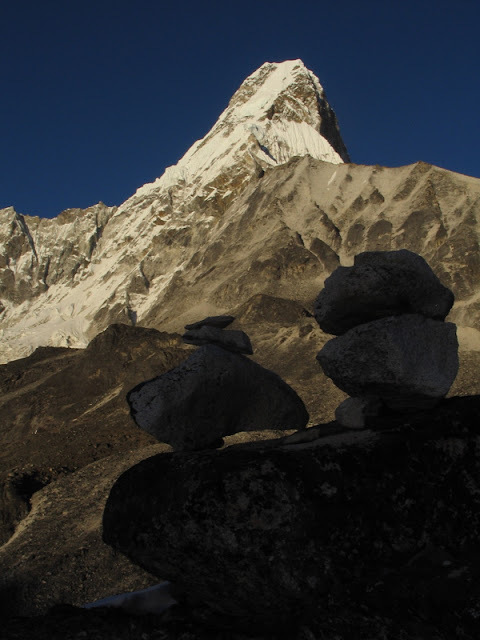 We have some space still on out Oct & Nov trips so let us know if you fancy a challenging climb on a high peak or if you want to undertake one of the great treks to Everrest Base Camp! 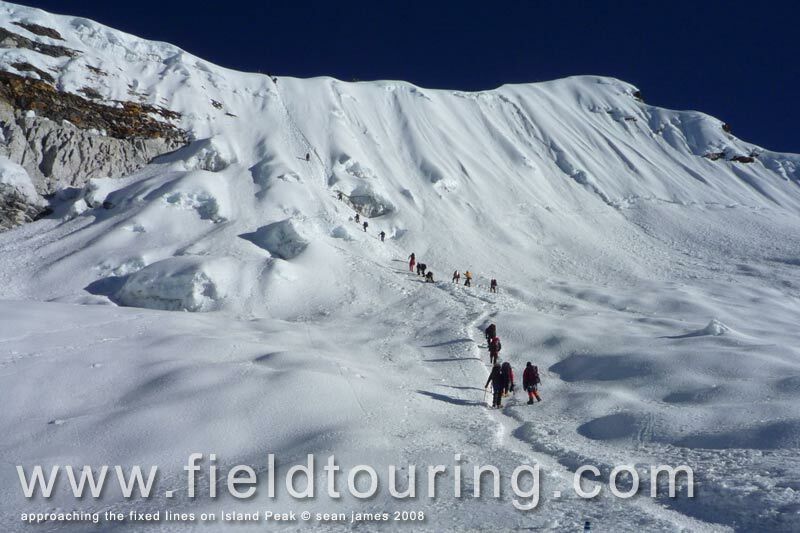 We are already filling up our February Aconconcagua False Polish trip and have comfirmed Polish Glacier climbs in January and February as well. We are nearing confirmation of Ecuador trips and have spaces in January and February. 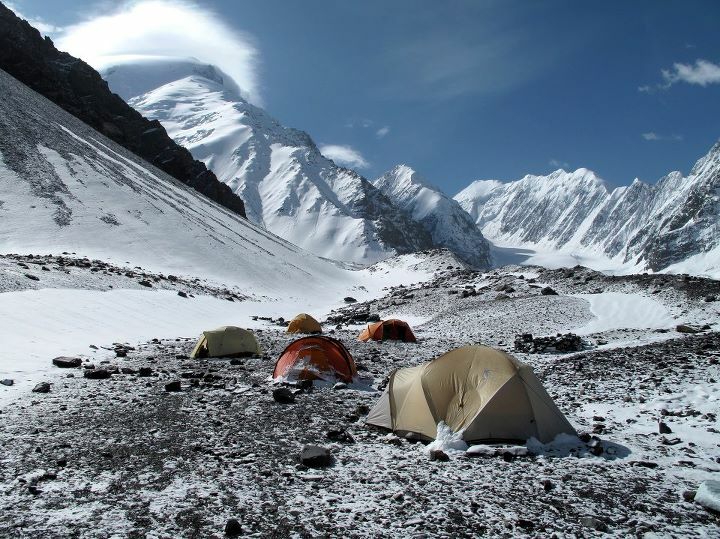 We have had a lot of interest in our new Noshaq trip for next summer as well as a confirmed trip to Stok Kangri next September. 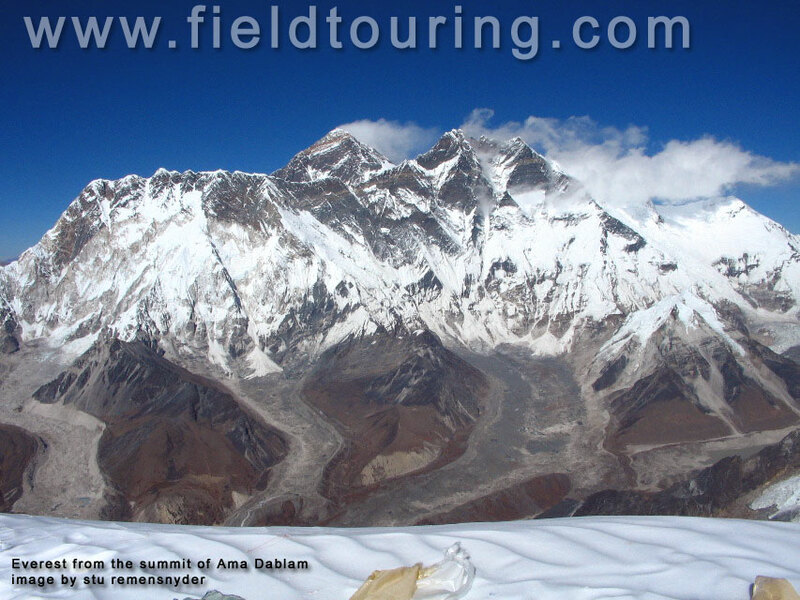 Along with our usual Cho Oyu in April/May, Broad Peak & G2 in June/July and Spanik in August we are hopeful to add Nanga Parbat and a host of new "prep" trips to our lineup. Heading to a high peak and want a specific prep trip without the delays and challenges of high altitude? Join FTA guides for 8000m & 7000m prep trips in the Cascades (USA). 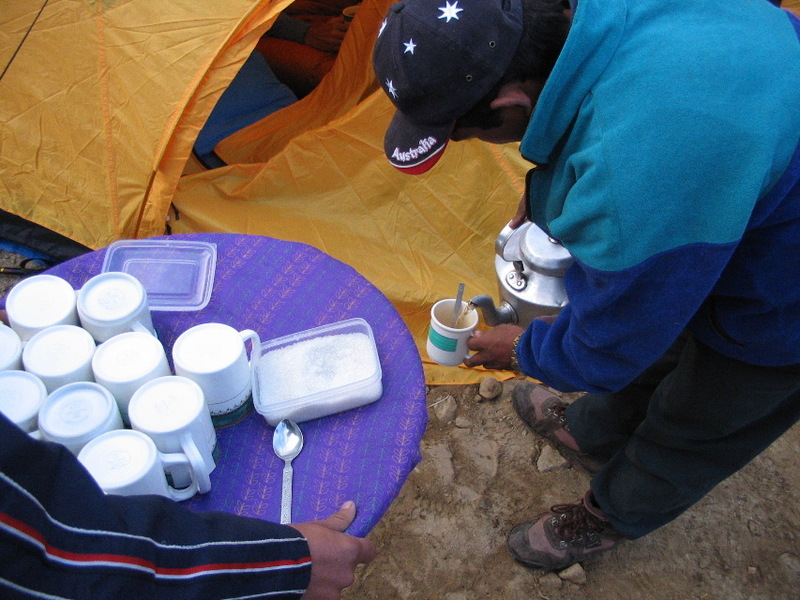 Add a little more altitude and join us in Ecuador , Alaska & Argentina for prep trips as well. Watch our site for more info in the weeks ahead or drop us a note and we'll add you to our mailing list! Ben called in just a few hours ago from C2 at 6000m to let us know that they are in position to make a summit bid tomorrow! 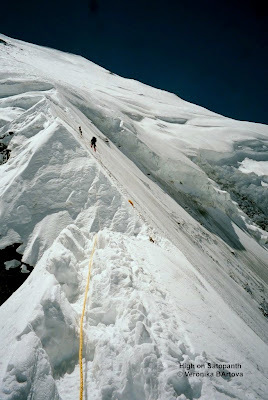 The route has been fixed out across the ridge (which leads to a sometimes used C3 at 6400m) and they plan to make a push from C2 to the top along with a Dutch team that is on the hill. At this time we have Ben, Suresh, Sawan, Nicole and Scott ready to leave at 4:30am for the top! Gavin is down at BC and doing well and ready to cheer them on as they make the push. As they plan to leave from the base camp on the 25th or 26th at this time they have some room for a second attempt but this will be likely their best moment. The weather is perfect and it has not snowed in some days so the conditions are quite stable. They have the steep part of the ridge prepared and have a strong number of climbers to push the route where needed! C2 vs C3 for a summit bid? 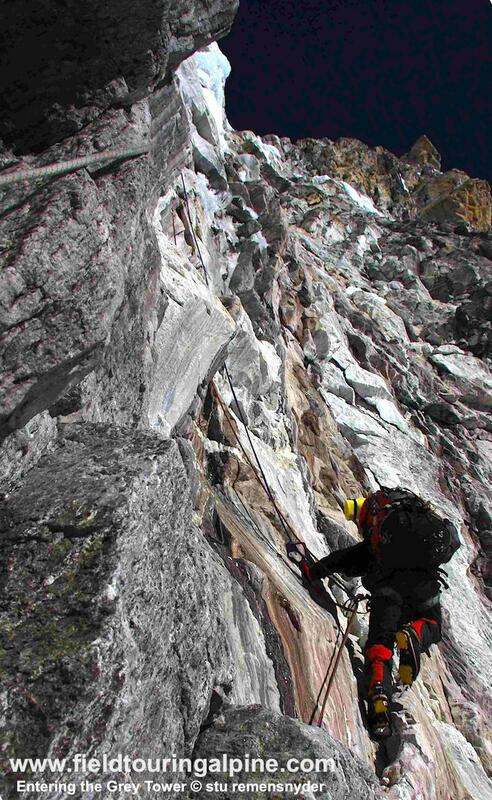 Making a push from C2 on Satopanth is akin to making a push from C2 on Ama Dablam. 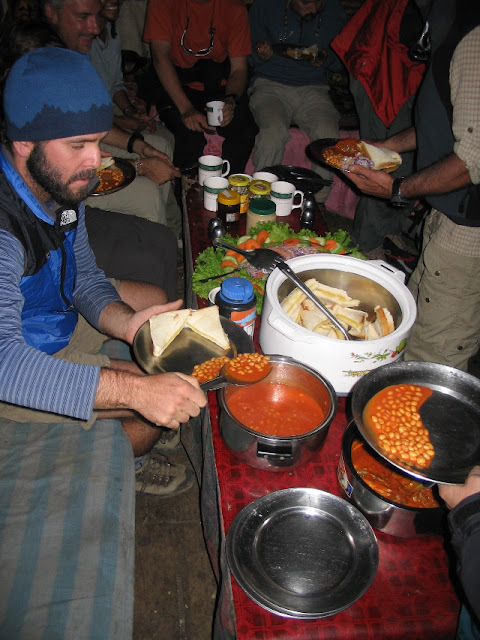 The benefits include being able to move lighter on steep sections without tents, sleeping bags, food, fuel and sleeping a bit lower means a better night of rest before the push. 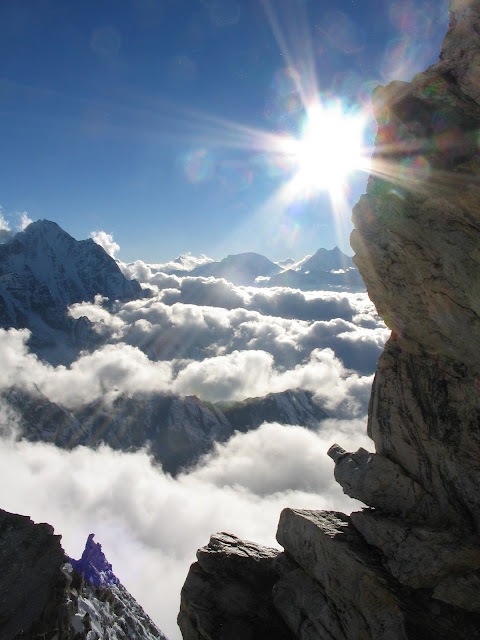 It does make a for a longer day and without a higher camp they may feel the altitude a bit more. 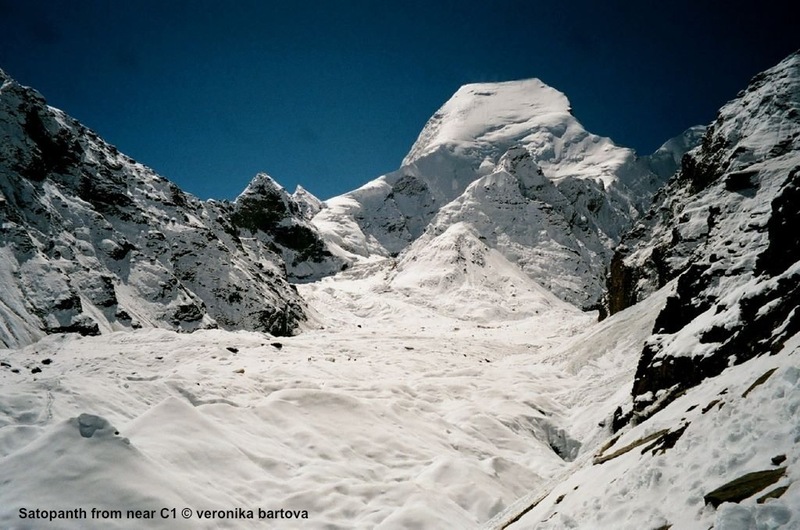 So their acclimatization and fitness will be tested for sure but they feel that the effort to push all the gear up to a C3 is not worth it for them as they feel they have the speed and strength for a summit from C2. The Dutch team is feeling the same way so that is good! Ben plans to call in at the end of the day and let us know how the effort and we'll post the news as soon as we have it. I asked about the earthquake and Ben said they never felt anything at all and had not seen any unusual avalanche activity. I shared the news of the event and the damage to life and property in India, Tibet and Nepal and he was sad to hear the update. He and the entire team share their condolences to everyone affected by the quake. Ben will come out from this trip and head right back to Nepal to lead our Oct 5 Khumbu Peaks & Passes trip and then our Nov 4 Ama Dablam. We have spaces on both trips still with last minute discounts available so let us know! Everyone at Satopanth is doing well and the route has now been pushed through to C2! Ben is at C1 and headed up to join the HAPs Suresh and Sawan in C2 tomorrow. Suresha nd Sawan are working on the route above C2 and Ben will join them and hopefully establish a high camp for a summit assault. Nicole and Scott and Gavin are all at BC after the round of acclimitzation runs. Gavin has decided to give up his summit attempt as his ankle simply is not healing up quick enough to manage the demands of uneven surfaces constantly torquing an old injury. He does however plan on enjoyig some day walks near BC in the meantime and joining the team for the walk back out to Gangotri. Scott and Nicole have already had nights at C2 and are ready to go for a summit bid on the 22nd if all goes well. They have a great stretch of weather right now and they have an excellent window for a summit bid ahead! 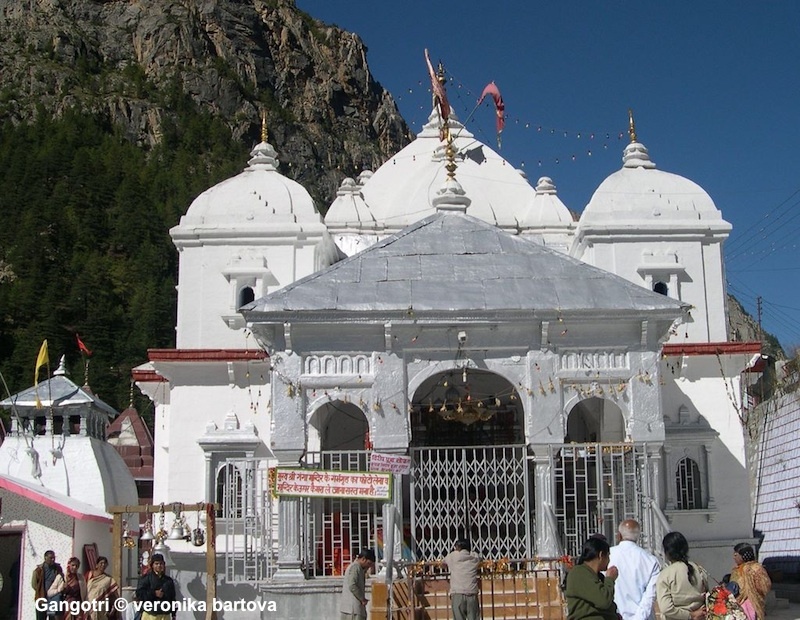 There has been a very serious earthquake with an epicenter in Sikkim which has shaken Kathmandu and Delhi and caused damage and fatalities in India, Nepal and Tibet. We have many friends in the region and we are very concerned for their safety and still getting word from around the region. We know that the quake was felt very severely in Kathmandu and it caused a lot of damage including a large wall on the British Emnassy that collapsed. 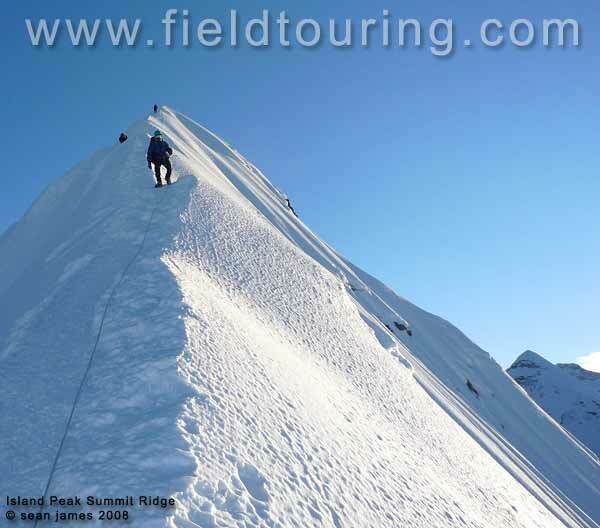 In 2009 our team was on the summit ridge when they felt the mountain waver under them due to an earthquake that was quite close to them. Ben plans to call in later on and we'll have the latest from C2 shortly. At that time we'll also find out of they felt the effects of the earthquake. Ben's latest dispatch was after the earthquake so we know they are all fine.